We have partnered with the best outdoor patio and porch furniture manufacturers, whose commitment to quality and sustainability matches our own. Each one of our manufacturers offer top of the line products in their specialties. Whether you want the finest durable teak patio furniture, low maintenance wicker furniture, outdoor furniture pieces that are made of fun bright, and environmentally friendly materials, or the best in Sun shade and outdoor rugs, at Burkholder, we have you covered. Look through our eBook to learn more about each of our manufacturers and see a sampling of their products. Download our brochure to see examples and learn more about our beautiful patio furniture. 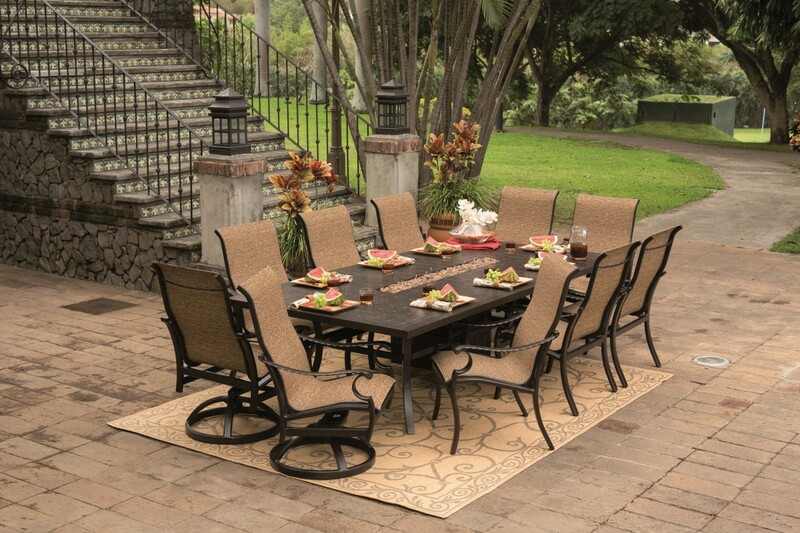 Let us help make your great outdoor space an irresistible oasis for family and friends! Your outdoor patio, deck, or porch should be an extension of your home, and they can be when you incorporate the same basic elements from the interior of your home. Things like color schemes, flooring, size, textures, and sun exposure are all important when choosing the perfect outdoor patio furniture for your space. The design experts in our Malvern Showroom can help you determine the perfect fit for your home and budget. Furniture and accessories are some of the most important features inside your home. Each furniture item is chosen for a certain reason or a specific need, reflecting your personality and taste, all the while being a part of an overall theme and design. The same goes for outdoor patio furniture and the spaces that accommodate “outdoor rooms.” Clients are always looking for those “must have” pieces to complete their new patio, deck or pool. Our job, as professionals, is to make sure your choices suit your personal style as well as fit the complete look of your outdoor living area. We will help you navigate the many types, styles, colors, textures, materials, finishes, and sizes of outdoor patio furniture. "Great company to work with - professional, and dependable." The Burkholder team is wonderful. The staff is knowledgeable and professional. They made us feel like we were the most important clients. We were (and still are) thrilled with the finished product. We definitely would recommend their services to other and will use them again in the future! We interviewed 6 different landscape companies to ensure we were selecting a trusted partner before embarking on the landscape transformation journey... we selected Burkholder Brothers for the project. They were the most creative, professional, honest, and trustworthy landscape company. They completed the project on-time, on budget, and truly exceeded our expectations at every step of the project. Even after the project was complete 3 years later, they continue to contact us to ensure we are satisfied. I would recommend Burkholder Brothers to anyone looking for a trusted partner in designing the backyard of your dreams. "On Time, Efficient, and Personable!" It was our first time working with Burkholder and they did a fantastic job for us on our home. They pretty much did a complete landscape design and redo of our front/backyard. Everything turned out so great, I couldn't be happier with the high level of customer service they provided us. Everyone I dealt with throughout the process was very pleasant and knowledgeable. We also found out recently that the plants were under warranty so if anything dies they will come by and replace them! I would highly recommend their services. Burkholder’s Outdoor Living & Design Center in Malvern features some of the top quality outdoor patio furniture we offer, from companies such as Ratana, Castelle, Breezesta, Three Birds Casual and Treasure Garden. Making a decision to purchase exceptional furniture is much easier when you can see and feel the difference in the quality. Seeing really is believing. Our furniture manufacturers make furniture that is meant to last, standing the test of time and the elements. Our teak products have been known to be passed down to the next generation! Burkholder has been designing, building and maintaining fine Main Line area landscapes for over 20 years. Our designers work with clients to create plans for transforming ordinary backyards into staycation getaways! We design and install outdoor kitchens, entertainment areas, pools, spas and much more. When the oasis is complete, we offer maintenance plans that allow you to spend your time enjoying your new space. Come visit our outdoor furniture showroom in Malvern for inspiration, and hands on experience with our outdoor patio furniture, or to learn about all that we offer.